Startups have a lot of questions and doubts. Here is a small sample of what I get. They are in no particular order (there may even be repetitions). Should I start a service company or get into products? How will I convince my family? How much money will I need before I start making some money? How long do I need to support myself (and family) with my own savings? Should I start on my idea while I am still working? Are there any legal issues I need to be aware of? I am technologist. Can I learn marketing and sales? I am marketing/sales guy. How can I get a tech guy to work with me? I have several ideas. How should I go about picking the right one? Should I build products based on my ideas or should I look for problems to solve? How many people do I need on my team before I start? Should I do a funded startup or bootstrap it? How do I get funding? How long does it take? What are the chances of getting funding? Should I work out of home? Should I find a co-working space? Should I have a good office? How can I attract people to my startup when I can’t pay them much? Should I build a product that is independent or build something on an existing platform? Should I use open source technologies or commercial technologies? I don’t know anything about finance and accounting. How essential is that skill for a startup? How long should I wait before deciding whether I have traction or not? Should I sell my products/services entirely through my website? What if my customers are not web visitors? There are hundreds of thousands of apps in the marketplaces. Is it too late to get in? My product is similar to the other product but much better. Is that a good idea to start with it? How do I get my first few users? How can I find people to test my product and provide feedback? Should I give a free copy to me beta users? Does beta make sense any more? What is an MVP? How do I decide what features go into an MVP? How do I get my first few paying customers? How do I scale to a few hundred paying customers? Should I price less than my competition, or more? How would people find my product? How much money should I spend on advertising? I am not a designer and they seem to be a rare breed. How important is design for the first version of my product? How can I find talent? I want do build on Python/Ruby but I seem to bump into .NET or Java or PHP programmers only? What marketing skills do I need before I start? There seems to be another formidable set – SEO, Writing captivating messages, call to action, website analytics, growth hacking, direct mail campaigns, designing surveys? What is all this stuff about inbound marketing/content marketing/curation? They never taught me any of these in my engineering course or even in a few entrepreneurship classes I took. Should I start with a Freemium model? Why? Why not? People keep telling me to find a niche. I have no idea how to go about it. Who can help? Every one I talked to, asked me what my business model was. What the heck is it? When I come up with an idea, how do I know whether some one already implemented? How do I find out? When I talk about my idea, my friend says that he vaguely remembers seeing something similar? Should I still go ahead? My idea for the product is not new but it will make life easy for users. Should I still do it? Some one said that a new product has to be 10X better than a similar product? What if it is just 1.5x better or I don’t even know how much better it is? Is there a place where I can ask all these questions? Add your own to the list. Lots of new faces and many familiar ones. TSC is a hub. It is a magnet. It is a bit of a brewery. It is one of the new places to be, if you are interested in entrepreneurship. You need not be an entrepreneur. You can just be curious about entrepreneurs or some one who wants to help them (like an angel or VC). You can be working somewhere and wondering why people start their own companies. It is a place for startup conversations. You always learn something new. You always meet someone interesting. I have been a regular (well almost). Now that it has come a bit closer to where I live, I will visit it more frequently. It is a place to hangout and talk tech. Or talk business. In this new place the atmosphere is just right. Yesterday, at the open house, I met a young group of students from IITM. Two of them are doing their PhD. They want to do a startup that has nothing to do with their PhD topic. Fascinating. Chennai’s entrepreneur ecosystem is taking shape. There are many groups that complement one another. TSC is one to go to if you are just starting. If you are a techie, hangout in Chennai Geeks group. Many interesting discussions take place both online (on Facebook) and offline in our meets. If are an entrepreneur or wannapreneur, attend a few Chennai Open Coffee Club meets. Some of the most interesting people I know in Chennai, I met there. If already found your startup and planning to grow – Filter Kapi is the place. Check it out. Every city needs a bunch of these groups. That is how you build an eco-system. We need to pull in the acadamics. Right now they are a bit of an island. TSC, as I mentioned before is a good hub. Naru hangs out there. Suresh does too. If you don’t know them, you need to make it a point to know them. Just one conversation with each one of them can teach you so much. TSC attracts people like Murali D. Have you met him? You should. Try to sit with him and chat about the entrepreneurs he meets. He can tell you a lots of fascinating stories. Vijay is tireless. He is trying to sow seeds of startup ecosystems, wherever he can. n50hrs is an experience you can’t afford to miss. It is one of those events that will make you wonder why you are not a startup yet. If you just want to see future unfold, right in front of your eyes, you want to go to a few of these meets – TSC, TiEChennai, Nasscom Emerge and now Product Nation with its Round Tables. They all add up. They are all trying to bootstrap a startup eco-system. They can use all the help and encouragement, they can get. Jump in. Participate. You will be happy you did. How to be interesting – How can you resist a book like that? Here is a little teaser so that you can go get the book and enjoy it. 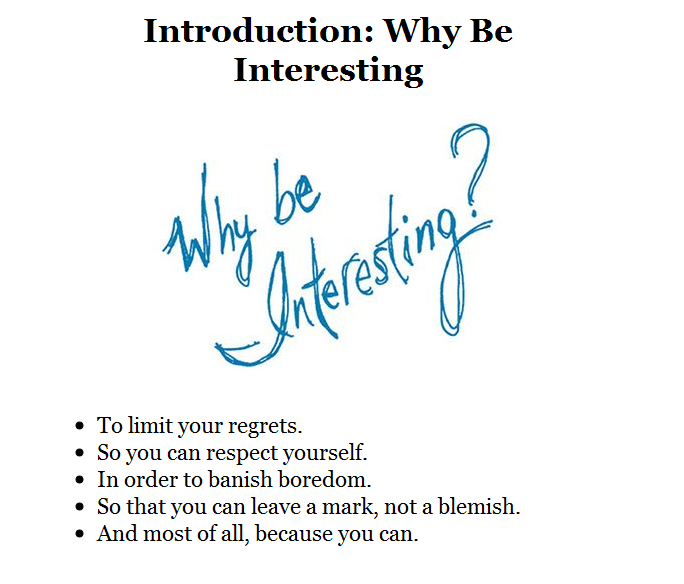 Of all the reasons my favorite ones are – in order to banish boredom and “because you can”. I love it when a simple graphic and a few words can say so much. 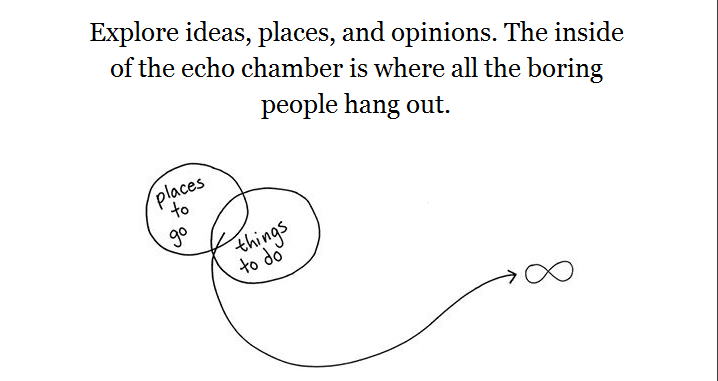 There is a comfort in echo chambers. It is a bit difficult to pull yourself away, especially when you are having such a good time. BTW, how many interesting people do you really know? I just finished reading it (for the second time). I read it almost 40 years ago. It is an amazing read. If you have not read it, I highly recommend it. If you love Science you will enjoy it even more. When you read a book, a second or third time, you notice a lot of things you miss the first time. The story is about a Scoop satellite that goes off its trajectory and lands in a small town (of about 50 people) in Arizona, USA. A team goes to retrieve it and finds a lot of dead bodies. They die too. A second team lands and finds that the entire town is dead but for two people – an old man and a baby. Those are the only two clues in addition to the satellite. The story is about the research that follows to identify the problem. I think it is the first book of MC I read and I think he was very young (probably in his early twenties) when he wrote it. “Michael Crighton’ s the Andromeda Strain centers on an investigation of a pathogen newly imported from outer space. The researchers struggle to understand the probable organism because it is so unfamiliar to them. In one interesting passage the character Leavitt proposes to his colleagues that black cloth, a watch and granite are living things. Our definition of life is limited by our experiences that create a frame of reference. We define life based on the life that we have observed, but. … what if we discover new possible life forms that do not fit currently accepted descriptions of organisms? Would that mean that they are not living or that our definition of life is too narrow? The impressive aspect of the book is reading about the planning that went into building a research facility before it was needed. The chain of events that get triggered by the falling of the Scoop satellite shows another amazing level of a system that functions. We don’t really think about the money governments spend in anticipation of future needs and planning to prevent disasters. The research lab described in the story was pretty sophisticated (even for that time) and I wonder what it will be like today. I could not help thinking about the role of computers in the story. I kept thinking how much computers of today would do it differently and how so many technologies can help. My final thought as I was finishing up the book was – “how can you prepare for the unknown”? Planning the Unplanned is a fascinating discussion that covers this a bit. The book left me with an immense interest in learning a lot more about Science. In the classroom, you’re given projects that are meant to test what you already learned, rather than send you on an excursion to find out what’s possible. Further, you don’t usually have to form a meaningful discussion out of describing the technical details of your project with people who aren’t programmers. When your academic experience of programming is one of being the carpenter that sits behind the scenes and quietly builds projects to predefined specifications, suddenly being given the command of an entire ship and being asked to lead an expedition to a new place is both exciting and daunting. Here are some strong reasons to intern at startups and community efforts like Learning Games Network. You are sent on small expeditions where you need to learn things by yourself. Good organizations give you broad specifications and enable you to explore. You are allowed to fail and learn from failures. You can try different methods and different approaches. You get guidance when you need it but good organizations give you time to learn at your pace and figure it out for yourself. You get to watch and learn from experts and peers. Some times, you learn things that you may not even know that you need to know. The best part of internship – you learn how to learn, one of the most empowering skills you can get at an early stage of your life.